The festive season is here and so being the chance to bring out our traditional gold sets which are otherwise safely locked away. But hey, this is when you meet with disappointment as you see these charmers losing their sheen. Now, what do you do? You are left with two options; either you get it polished from a jeweller, or you resort to these home hacks to keep them new forever. In the age of hectic schedules, we suggest you go for the latter. Whether it is your pearl, gold or any other kind of jewellery, it is possible to make them look brand new, every time you adorn them. In fact, with the help of some amazing home hacks, you’ll find that the classic diamond bracelet, or stylish gold earrings or your lovely pearl jewellery stays new forever. While gold doesn’t tarnish, but it can lose its sheen from the oils on your skin, body lotion, makeup or other substances. Use a milddetergent and mix it with warm water. 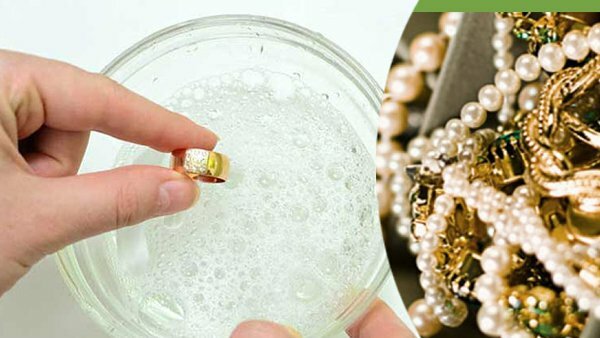 This method is surprisingly very effective in cleaning gold jewellery. You will need to soak them in the solution for about 15 minutes and then wash it thoroughly. You will be surprised with the results. However, ensure that your piece isn’t embellished with gemstone. This could cause the gemstone to loosen. The best alternative is to use a soft damp cloth and wipe the soapy solution on the gold and then again gently wiping it off with a cloth dipped in plain water to avoid any scratches. Your jewellery may have some hard to reach places which are difficult to clean. Using a soft bristle brush gently has often proved successful in getting gleaming results. You must be careful to ensure the brush you are using is not a medium or hard bristled toothbrush to avoid any scratches. Simply dip your toothbrush in soap water or any other cleaning solution and scrub away on the areas which need cleaning. But always remember to rinse thoroughly and allow it to dry completely. While this is one of the best methods of cleaning gold jewellery to remove very stubborn dirt, it also requires a lot of care when done at home. You need to remember that using it very often may discolour your jewellery, hence should be applied sparingly. All you need to do is make an ammonia solution which has six portions of water and one portion of ammonia. Since the solution is quite powerful, you need to soak it for just a minute. Finally, don’t forget to rinse thoroughly and completely. Not only does it sound simple but is also very easy. All you need to do is fully immerse your gold darlings into boiling water. It will without difficulty remove the dirt making it look as good as new when you finish. Again for delicate numbers especially the ones with gemstones, this method is not the best opt for. Finally, let it dry upside down to allow all the water to drain out completely. Cleaning your gold and gemstone jewellery is easy with alcohol. Just polish the gold with alcohol to remove the dirt on it. The alcohol will also help sanitize your gold, but this hack cannot be used on all your gold designs. The prime concern here too is the risk of gemstones coming off. The trend of ornate pearl jewellery is gradually taking a backseat. Sleek and stylish designs offered by online jewellery stores like CaratLane are trending in the market. These designs also require less maintenance. So if you are a busy bee, and don’t have time to clean these precious adornments, then minimal jewellery trend is what you should turn to. I usually use boiling water and few drops of lemon to clean my gold ornaments but it's really good to know about the other options. Will definitely try them out next time.